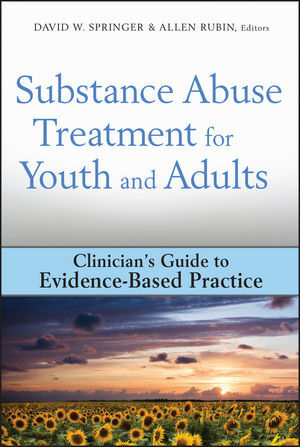 Part of the Clinician's Guide to Evidence-Based Practice Series, Substance Abuse Treatment for Youth and Adults provides busy mental health practitioners with detailed, step-by-step guidance for implementing clinical interventions that are supported by the latest scientific evidence. Easy-to-use and accessible in tone, Substance Abuse Treatment for Youth and Adults is an indispensable resource for practitioners who would like to implement evidence-based, compassionate, effective interventions in their care of substance-abusing clients. David W. Springer, PhD, is the Associate Dean for Academic Affairs and a University Distinguished Teaching Professor in the School of Social Work at The University of Texas at Austin. Allen Rubin, PhD, holds the Bert Kruger Smith Centennial Professorship in Social Work at The University of Texas at Austin and serves as Chair of the Evidence-Based Practice track for the Council on Social Work Education. Edited by leaders in the field and contributed to by both seasoned clinicians and newer practitioners with expertise in relevant, cutting-edge evidence-based practices. Each contributed chapter follows a consistent structure including an introduction; a detailed and practical step-by-step guide to the intervention; indicators and contra-indicators; cases, and additional resources, making the book an easy-to-use and essential resource for practitioners and students-in-training. User-friendly appendix briefly reviews the research support of the interventions presented.